Too Little, Too Late? - Cars! Cars! Cars! "Hey, I'm here!" says the little smart car. "I'm ready to tackle the big gasoline prices." ... "Doeth!" 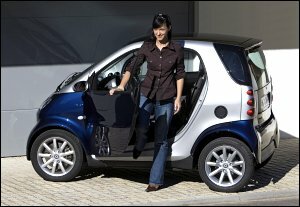 Kicking Tires reports: Smart Really Coming to U.S. in 2008. Oh, never fear little smart, gas prices will go back up. Thanks to the recent election happenings, we are going to have to revise our gas prices prediction (more on that when we actually make the predictions). In any event, the smart car is on its way (for sale in 2008). Not familiar with the smart car? Think of the smallest car you know. Then chop it in half. And now just a pinch more. No, a little more. There. That's a smart car. You can see more of it here: smart goes USA. What do we think? In an age of excess (excess), we appreciate seeing some restraint. These smart cars make 100% sense in a big city like New York, San Francisco, Portland. But they don't make a lot of sense for folks who have to do a lot of highway driving or who have a lot of people to tote around. We haven't found prices or sales expectations, so we can say if DaimlerChrysler has its head on straight, but the idea could work. What do you think? Would you buy one? That's a snap of a smart car. Small ain't it? Is that good or bad? the event and thought the group would be interested in seeing the video. Try that with your Ford F-150 - there wont be anthing left of it. And though its not really fun to do, but you can travel on the autobahn pretty well with a Smart. My aunt was driving her new Chrysler 300 and was t-boned by a SMART that was doing 90km/hr and it wrote off her car. The guy in the SMART walked away without any injuries and he was still able to open his doors. These things have a good safety rating. Maybe you should do some research before you make a judgement. I have heard many stories about accidents that involved SMARTS and how little damage was done to the car. Neat little car and I guess for the person who feels better about themselves for using only the absolute minimum of fossil fuel to get from Point A to B and has little concern for the safety of themselves or their passengers. I think the real cost would be the remains at the scene of an accident involving one, and I just have a feeling if you did survive, you would be so crippled you wouldn't have to worry about driving a car ever again. I know this little car does well in Europe, but thats in cramped little towns where congestion rarely allows anyone to get above 30 MPH. In this country we have a much larger mix of traffic on our roads that has to be considered. I would love to be able to use a car like this to get around, but I value my life and being alive for my children a few more years so I would not be able to give this car serious consideration.